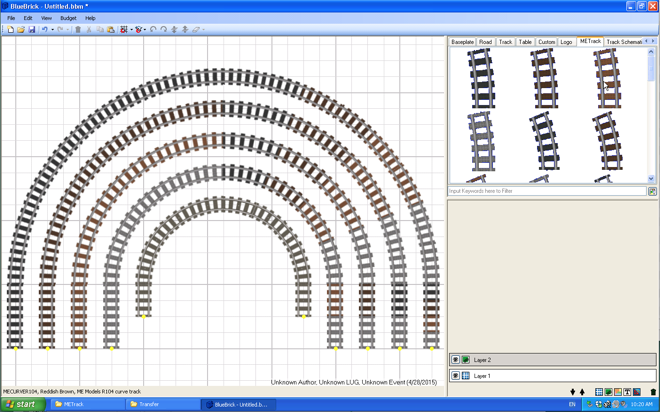 I have updated the ME Models track components library to include all of the available sleeper/tie colour choices made by ME Models. These include all of the R104, R88, R72, and R56 curves as well as the double, full and half straight components. All of these components are rendered in 4 colours: Black, Dark Bluish Gray, Dark Brown, and Reddish Brown. Each colour will be identified correctly for the purposes of compiling a Bill of Materials for your layout, with the exception of Dark Brown. BlueBrick does not identify the LDraw colour code (308) for dark brown and therefore it is indicated as an unknown colour. Hopefully a future update of BlueBrick will remedy this very minor issue. For your convenience you can download each colour as a separate library or you can download the entire collection in a single zip file. Head over to the resources section to download this updated library.